The American Home Elevator Company Offers Installation & Service of Quality Lift Products in Northern & Central Ohio. The American Home Elevator Company is locally owned and operated business. We are big enough to have a wide selection of quality products available for our customers, but we are small enough that we can take the time to know our customers personally and by name. Many of our customers have been with us for decades. At the American Home Elevator Company, we have a full-time responsive office staff, as well as full-time technicians. This means that we never use subcontractors. It also means that quotes on installations and repairs are usually ready for the customer within a day after receiving the specifications for the project. Residential elevators are smaller, more compact units that give you the convenient and elegant access between all levels of your new or existing home or condominium. They offer plenty of space for an individual in a wheelchair or for transporting boxes or storage to other floors. The inclined platform lift is designed to ascend or descend a staircase with a platform for wheelchair access. The stair lift is designed to transport individuals up stairways. They can be designed to fit all kinds of stairs from straight stairs, to stairs with a platform, and even spiral staircases. They provide accessibility without drastic changes to an existing home. The commercial passenger elevator is available in both low and high capacity configurations - accommodating both passengers and freight. Travel height up to 3 stories with many features and can be incorporated. LULA (Limited Use / Limited Application) Elevators are designed to meet the needs of public buildings to bridge the gap between vertical platform lifts and commercial freight or passenger elevators. 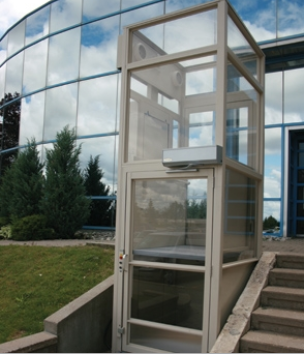 The vertical platform lift is designed for indoor or outdoor use to transport individuals. These units can be installed in a stand alone open application or into a hoist way. Elevator to our customers and in our communities, our employees accept responsibility for demonstrating true commitment to the highest ethical standards. We build loyal, long-term relationships with our customers by treating them fairly, meeting their needs, and earning their trust. These relationships, sustained by personal honesty and integrity, are the foundation of our success. We value the many differences that make each of us unique and know that these differences help to advance our success. Simply put, we want to nurture a business environment that is responsive to all. This is an integral part of who we are as a company and as individuals. For more information on the stair lifts, residential elevators or our other lift products sold at the American Home Elevator Company, give us a call today toll free at 800-882-1987, the Toledo/Coporate Office at 419-837-6596, the Columbus Office at 614-403-7911, the Lima Office at 800-882-1987, the Cleveland Office at 800-882-1987 or email us at patty@ahec-oh.com. No hassle, no aggressive sales pitch, no robotic calls! We are a small business that takes pride in our craftsmanship and customer relationships. The American Home Elevator Company offers installation and service of quality lift products in Northern and Central Ohio. We pride ourselves on providing safe, economical stair lifts, residential elevators and other lift products that make life easier for the disabled community. We know how important accessibility is to everyone and we work hard to present the best and most practical solutions to our clients.